After about 6 month away, I’M BACK! After struggling with infertility for 6 years, the last thing I expected was to get pregnant again so quickly. 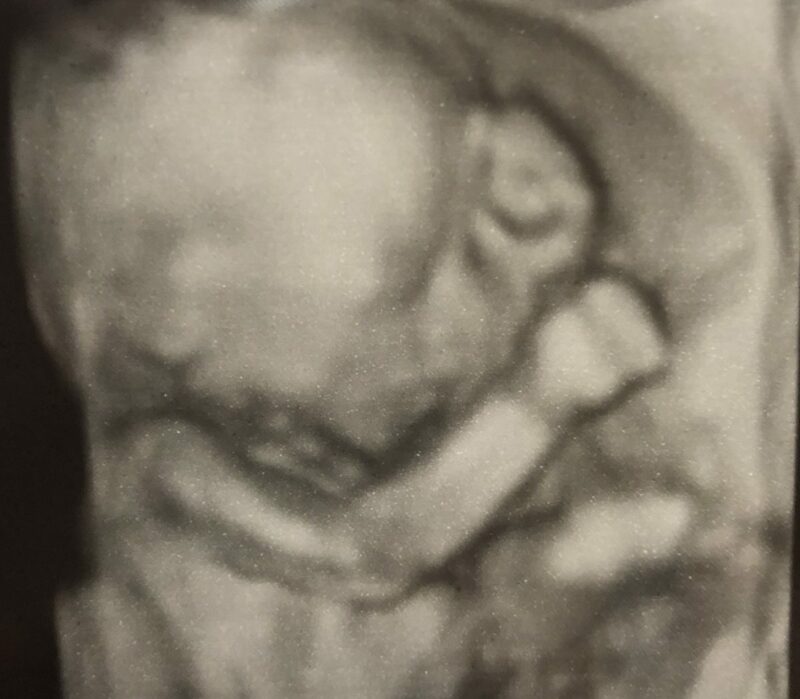 Planning for baby number 2 is something that we thought we would have a little more time for but it seems God had other plans. Now that baby girl is on her way we have been working on getting ready for her. I have to say its been a little different than getting ready for our son’s arrival. There are definitely fewer things that we need but also new challenges. 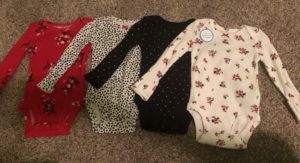 The first thing I did when I found out that I was having a girl this time around was go through my son’s old clothes and pull out everything that was gender neutral. The nice thing is that we have a decent amount of outfits that will work for her and even things like a football onesie can be made girlie with a bow and a tutu. In addition to finding quite a few outfits that could be reused, we also started moving things like our baby swing and tummy time mat from our son’s room to our daughter’s room. Swaddle blankets and burp cloths are also being handed down from my son to my daughter. There are a few things we need to double up on for baby number 2. We of course need to buy her some of her own clothes, especially since I love everything girly. The main things we need to buy again are things that my son is still using, like a nursery furniture. There are some things that they could share but we will probably buy her some of her own like toys and pacifiers. We will also be doubling up on things like wipes and baby wash. Not to mention the fact that we will now be buying 2 sizes of diapers. Check out my top picks for wipes here. If your babies are farther apart in age and you already started getting rid of baby item, you will likely have to buy a lot more for baby number 2. Deciding where the new baby will be sleeping was another thing we had to figure out. We had already decided that she would sleep in our room for the first coupe months, but once she’s ready for her own space would we put her in our son’s room or give her her own room? We weighed the pros and cons of each and decided that converting another bedroom in our house into a second nursery would work best for us. The biggest deciding factor was the fact that the two babies will likely be on different sleep schedules for a while and the last thing we want is to have them waking each other up. If you decide to do separate rooms, the nursery checklist for baby number 2 will be very similar to the first time around. Although there is a lot less to buy with baby number 2, there are some added challenges. My son isn’t walking yet and carrying around a baby gets more and more difficult the more pregnant I get. I also had really bad morning sickness with this pregnancy so there were times early on that I had to stop feeding or playing with my son to go throw up. Once my daughter gets here there will be more added challenges having two under two. Despite the challenges of having two babies so close in age, we couldn’t be more excited to welcome baby girl into our family. This pregnancy is flying by so much quicker than my first and she will be here before we know it. Read on to find out my favorite way to relax while pregnant. Boy does this bring back memories. We were told by doctors that we could not have babies so we adopted. One year later later our daughter has a brother. I cab not say how blessed we were and your website will help any expecting mom to do the right thing and care for their baby. And the next step of caring for a little one while traveling is a real challenge. Congrats on the adoption as well as the pregnancy. Sometimes God works in mysterious ways. We were in the process of adopting when I got pregnant with my son and then when he was only 5 months old I found out I was pregnant again. We tried for 6 years unsuccessfully before that. Thanks for this article it is really helpful, my first and second baby where boys but the third is a girl when my wife delivered the third baby it never hit us that she can use some of the things of the first and our second baby. we had to buy her new materials all through assuming I saw this post then I would have safe a lot of money. Thanks for this post it is really helpful. I’m sure we also bought some things that we didn’t need to buy again, but were trying to reuse as many things as we can. How far apart were your kids? Congratulations on baby girl! It sounds like you guys have done a great job of evaluating your needs and planning how to address them. Your son is so precious and I think having a little girl with a big brother so close to her age will be great for building a strong, untouchable bond. I have an older brother, but he’s four years older. We were close but we grew apart as we got older because we weren’t interested in the same things at the same times. Another silver lining to having your babies close together maybe? Anyway, I hope the pregnancy goes well and wish you only the most joyous moments to cherish with your two little bits. Congrats again! Thanks so much. We’re beyond excited, especially since 2 years ago we weren’t sure if we would ever be able to have kids. I hope they grow up close and that my son is a good protector for her as they get older. Goodness I remember going through many of these challenges with my children, and now with grandchildren, I am able to offer the benefit of my experience and offer assistance as well. 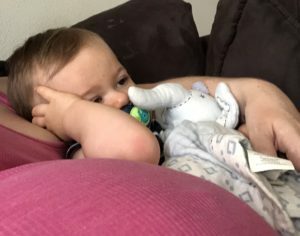 It can be a difficult time when the first baby is still not mobile and I can sympathize with morning sickness while trying to take care of another little one. The morning sickness was definitely the hardest for me because I felt like I was being a bad mom to my son. Luckily my son is walking more and more every day so by the time baby girl is born I hopefully won’t have to carry him everywhere. Congratulations Briana! Second baby on the way, is a Girl, so SWEET! It is not easy for you during pregnancy and taking care of your baby boy at the same time. I’m glad to hear that you find this pregnancy flying by quicker than your first. Take care. Thank you Christine. Yes, it’s such a blessing every time. Even though I’m going to have my hands very full with 2 under 2, I can’t wait for baby girl to get here.